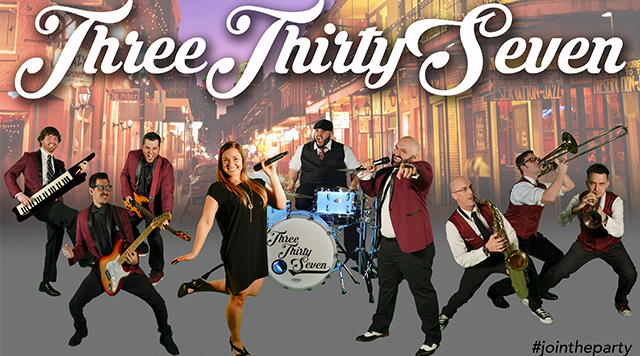 Hailing from the cultural oasis of Lafayette, LA, Three Thirty Seven is an award-winning 9-piece event band that routinely lights up stages across the entire Gulf Coast. The high-energy live show features a sizzling horn section, spirited vocals, and a vast array of top hits across all genres of music. A tight-knit band of seasoned musicians, Three Thirty Seven draws from a well of Top-40 radio, 80’s and 90’s nostalgia, Motown grooves, and country classics to deliver an unparalleled musical experience. Three Thirty Seven original sound was born out of their roots in southwest Louisiana, where the group quickly built a loyal local following. Their first album debuted in the I-Tunes Top 40, and they quickly expanded to become an in-demand group for festivals, weddings, club shows, and corporate events. Whatever the venue or occasion, Three Thirty Seven throws a party that will keep you engaged and on your feet.